The G7 summit in late May brought to the fore the question of cooperation across two continents under US leadership in the face of intensifying challenges from China in Asia and Russia in Europe with both of those great powers resisting the toughest sanctions on North Korea. During the late Cold War, in the face of a Soviet threat to both Europe and Asia, the G7 presented a common front. Today’s challenges raise new questions. Are China and Russia a combined threat or distinctive threats that should be seen differently in Europe and Asia? Are economic relations so important that they should be kept separate from security concerns? And are US allies in both Europe and Asia committed to the same “universal principles” and prepared to take a common stand on serious security challenges no matter the continent? The search for new ways for European and Asian countries to work together in facing problems in Asia requires new thinking, which the authors of this Special Forum are offering. The Shangri-La Dialogue a week later saw defense officials from Washington and Tokyo present a united front with European officials on hand. During the June 3-5 meeting, French Defense Minister Jean-Yves Le Drian called for a more visible European navy presence in the South China Sea. Michael Fallon, the British Defense Secretary, asserted that defense is “international-by-design,” arguing that London is deepening strategic relationships with not only primary allies, but also with allies in the Asia-Pacific region and calling on the European Union to flex its financial, diplomatic, and legal muscle here, as it has with Russia. The subject of joining together across regions has gained new visibility, and it is timely to reflect on how it might proceed. The challenges are many. They include: sanctioning North Korea in unprecedented fashion, supporting freedom of navigation in the face of military threats, combining military alliances to cover more maritime routes, and standing on principle when it comes to extending sanctions against Russia as long as its conduct in Ukraine is not changing. They also involve: cooperating economically to shape both Russia and China’s conduct, despite economic sacrifices that have to be made. On the European side, hesitation to take a strong stand against China (with attendant economic costs) is a concern, and on the Asian side, Japan’s waffling on how to deal with Russia (with new economic initiatives) also raises concerns. Another country discussed below is India, which could be a bridge between security efforts coming from both directions. The June 7-8 visit of Prime Minister Modi to Washington heightened interest in this. The five articles in the Special Forum begin with Daniel Twining’s discussion of how to leverage the US Asian pivot and the transatlantic alliance to reinforce each other with India one subject of interest. This is followed by Michito Tsuruoka’s treatment of finding synergy between NATO and East Asian models of extended deterrence. In the next slot is Michael Reiterer’s exploration of how the European Union can play an active role in the regional security architecture of the Asia Pacific. 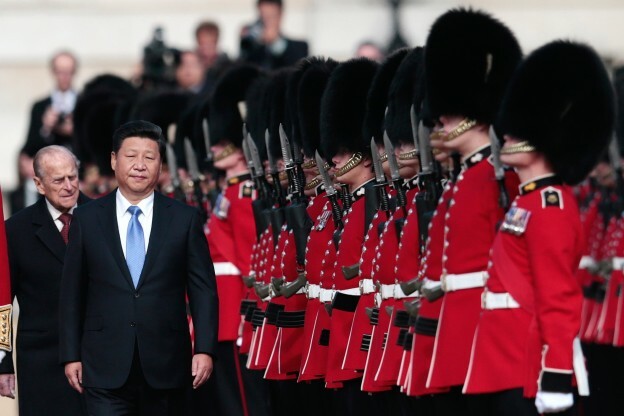 The fourth article stresses ties with China, as Kerry Brown covers Great Britain and China, a theme that drew new attention in late 2015 when Xi Jinping visited London. Finally, Theresa Fallon writes about EU-US tensions on such matters as market-economy status, technology transfer, “One Belt, One Road,” and the South China Sea. China figures heavily in a triangular context, whether with the United States or with Japan. These articles should be read in full awareness of Japan’s pursuit of Russia, widely covered in this journal, which has also tested its relations with the European Union as well as the United States. Daniel Twining asserts that theeroding global liberal order requires the United States to leverage its European allies to support common goals in Asia, while securing greater support from Asian allies for transatlantic objectives, on the grounds that the international system is at risk from developments in and around both regions. Washington and its allies in Asia and Europe could rise above their regional agendas to cooperate systematically across regions, Twining argues. This includes countering great-power revanchism in Europe and Asia; championing the indivisibility of the global security order; enhancing solidarity between Atlantic and Pacific allies; deepening democratic partnerships; standing up for universal values rather than bowing to the new authoritarianism; and renewing economic growth as the foundation of effective grand strategy. Both the United States and Europe should more expressly support Japan’s ambition to serve as a regional security provider in and beyond Asia as an additional move to realize these objectives. Twining focuses on Japan, asserting that nearly as critical as collaborating on defense within their respective regional theaters is Japanese support for the integrity of the European security order, and European support for the integrity of the Asian security order. Crediting Japan for its imposition of sanctions on Russia—which should remind its European partners of the common threat they face when major powers seek to change the status quo by force or coercion—he argues that European leaders cannot claim they are “neutral” in the face of China’s territorial revisionism in Asia in violation of principles of international law, or that they cannot take a stronger position because Europe does not have the same security commitments or capabilities in the region as the United States. European leaders cannot simply write off Asia as being too far away, or outsource European interests in freedom, security, and the rule of law to the United States and its allies there. Instead, the European Union and individual European powers must heighten comprehensive (not just commercial) engagement on Asia, including through closer cooperation with the United States, Twining insists. The case is made for closer cooperation: joint patrols of the global commons in the Indian Ocean that link the Atlantic and Pacific domains; collaboration on missile and cyber threats that cut across regional dividing lines; military training and education programs that transcend regional boundaries; and joint planning for contingencies in the “in-between” spaces of Africa and the Middle East. A new trilateral alliance spanning the Atlantic and Pacific realms could help offset pressures on the global system, including those created by the projection of Chinese power and influence well beyond East Asia. As for China’s response, Twining observes that it is bound to take combined protests from the world’s leading powers more seriously than when they are done in isolation. Given barriers to trade and investment in China’s state-directed economy, the pursuit of “competitive liberalization” by enacting high-standard trade agreements among market democracies in Asia and Europe could incentivize leaders in Beijing to pursue liberalizing reforms. Together, the United States and its European and Asian partners enjoy a preponderance of military power, dominate international institutions, and enjoy the soft power afforded by their open societies—an underappreciated asset in the strategic competition with China and other non-democracies. America and its Asian and European allies should not underestimate their combined ability to steer the coming era in a direction that continues to privilege their interests and values, while integrating friendly rising powers like India, in ways that channel China’s own choice ultimately to join the global liberal order rather than subvert it. Twining is optimistic about a European role in Asia, reaching beyond the triangle and pressuring China to reconsider its options. Michiko Tsuruoka finds a substantial difference between the NATO model and the practices in East Asia—mainly the US-Japan and US-Korea alliances—or the East Asia model. The former is based on nuclear-sharing and the forward deployment of US nuclear weapons, whereas the latter lacks such features. Yet he argues the need to move beyond such a dichotomy, so that East Asia and Europe could learn from each other’s practices and experience. To realize this, he adds, we need a solid understanding of the similarities and differences of the European and East Asian debates on extended nuclear deterrence, the role of nuclear weapons, and wider regional strategic environments in which the two regions are situated. Japan and South Korea have been making more efforts to maintain and enhance the credibility of US extended deterrence, facing what they perceive as a deteriorating security environment, most notably due to China and North Korea. Common to the two allies is to start and strengthen consultations with Washington on nuclear deterrence and extended deterrence. Naturally, they look at the NATO model for ways to strengthen the US extended nuclear deterrence commitment. Despite different contexts, security situations, and histories, Europe and East Asia are now facing an increasingly common challenge regarding how to maintain the credibility of US extended nuclear deterrence, Tsuruoka notes, adding that the biggest challenge for US allies in both Europe and Asia is how they can keep Americans serious about consultations. One step is to keep showing to the Americans the merits of maintaining nuclear consultations with their allies, including through shouldering more burdens and responsibilities. The newest nuclear-related challenge that confronts both Europe and Asia concerns nuclear saber-rattling by Russia and related fear of the limited use of nuclear weapons by adversaries—mainly Russia, but to a lesser extent China as well. NATO’s European allies and Japan and South Korea are increasingly facing a similar set of challenges, including the issue of extended nuclear deterrence. In this context, allies are advised to learn from each other and work together on boosting nuclear deterrence. Regional Security Architecture in the Asia-Pacific Region: What Role for the European Union? Michael Reiterer posits a much-enlarged role for the European Union, as an entity, in forging the new security architecture in the Asia-Pacific region as part of a new global strategy. In the last six decades, the European Union has acquired experience and know-how in institution building according to the rule of law, conflict management, disaster management, and, most importantly, overcoming a tradition of war and hatred. Many of these achievements are now challenged, but the assumption and hope is that the trust in institutions and the habit of cooperation will help to weather these challenges. Reiterer calls on the European Union to change its approach to foreign and security policy from ad hoc reactions to strategic planning, from words to deeds, from putting out fires to securing the environment. Given that the Asia-Pacific trade has become economically more important for the European Union than the transatlantic trade, he sees the fact that multilateral institutions or cooperation frameworks have become part of the diplomatic toolbox also in Asia as opening a natural dimension for EU engagement based on its own history and experience. Cooperation with ASEAN is at the center of Reiterer’s argument. Having overcome the de facto blockage of its long-standing relationship with ASEAN over the issue of Myanmar, the European Union as one of the important dialogue partners has honored ASEAN’s call for engagement beyond trade and economics and is ready to go further as laid out in the 2015 EU ASEAN paper and the 2012 Bandar Seri Begawan Plan of Action to Strengthen the ASEAN-EU Enhanced Partnership (2013-2017). Critical to this engagement, he notes, is participating actively in the East Asia Summit (EAS). Since 2011, when the United States and Russia joined, the EAS has moved to center stage in the institutional framework—if not yet in deeds than in terms of rhetoric and discussion. As multilateral cooperation on transnational matters and managing a comprehensive regional integration process security order are some of the core competences of the European Union, it has very good credentials to be invited into the EAS, Reiterer asserts. The challenge is to find a functional approach to cooperation in areas where the European Union credibly can make a difference. The European Union will need a new narrative to make a more effective and credible contribution to Asia security. This means concentrating on a few areas where experience, best practices, and working in a transnational environment make the difference: strengthening and participating in the developing regional architecture, contributing to conflict management through upholding the rule of law—in particular in the South China Sea—assuring cyber security, and connecting with "One Belt, One Road" in conjunction with ASEAN connectivity could be a viable selection. This is Reiterer’s proposal, which he bolsters by describing the European Union as a laboratory for developing answers in a regional context, which can inspire international solutions based on a cooperative approach of very diverse partners: “unity in diversity” can go a long way as long as there is enough unity. Acting as a global soft balancer, pursuing a principled albeit interest-based policy based on international law and the rule of law in general, and striving to support regional and/or multilateral solutions with cooperative diplomacy and soft integration, the European Union can offer a complementary approach to politics in Asia, quite different from major powers competing for supremacy. Kerry Brown observes that there has been talk, especially around the time that Xi Jinping visited London in late 2015, that Great Britain is too beholden to China economically to stand with its ally the United States and, especially, with Japan in the face of growing aggressiveness. Yet, he finds more room for Great Britain to play a role, beginning with overcoming mutual misunderstanding and disappointment in relations with China. He observes that the two, since the mid-90s, have had to work with each other economically, which has grown into embracing new areas of governance and security, leading, at times, to clashes. Brown finds both sides trapped by images about their own identity, which frame their mutual attitudes. He finds the EU attempt in 2003-2005 to lift the arms embargo on China in place since 1989 to be the greatest example of a clash of expectations, as Great Britain tried to assert an interest with which the United States did not agree, attempting to extend the reach of its huge economic cooperation and the importance thereof to China and the world into the realm of security. This illusion of autonomy beyond its recognized core competence as an economic and market actor continued until sharp US rebukes and forceful diplomacy stopped its moves to revoke the embargo. The European Union believed it had more diplomatic autonomy, and the Chinese that their economic importance had greater scope than it ultimately proved to have, concludes Brown. Brown adds that theEuropean Union has had to control some of its ideals about being a model of multilateralism and liberal values, acknowledging that these have less resonance in China than it once believed, and China has had to accept that the European Union will never become a counter balance against the United States and a key player in a multipolar world. Both sides have had to continuously revert to understanding their relationship as primarily economic, despite mutual hopes for something more. Arguing that to speak on security issues in Asia is challenging for the European Union because it is not taken seriously, Brown concludes that its security role on issues like the South and East China seas is largely to use diplomatic leverage and some of its soft power assets, and to stand closely beside the United States, i.e., its security dialogue withChina is underwhelming, and mostly parasitical on the role of others, particular the United States. For what has been termed the prosperity agenda, the role is much clearer and more tangible for the European Union than in the security realm. The EU-China trading relationship ranks just behind the Sino-US one, therefore, as the largest in the world the European Union has yet to confer on China market economy status, largely through its assessment of Chinese protectionism and state subsidies of key sectors in the economy. His chapter concentrates on difficulties in the economic relationship, finding that since 1997 and the Hong Kong reversion, while there have been lengthy periods of benign, largely apolitical “engagement,” where the onus has been on speaking bilaterally as much as possible about trade and economic issues that directly benefit the United Kingdom and avoiding the contentious issues, there have also been intense, short periods of unharmonious clashes, sometimes precipitated by residual issues from Hong Kong, sometimes separate from them. Between 2014 and 2015, in a series of largely unilateral moves, the United Kingdom puzzled both its EU allies and other allies by, first, joining the Asian Infrastructure Investment Bank (AIIB), initiated by the Chinese, in April 2015, and, then, in October of the same year, hosting President Xi Jinping for a five-day visit, which one Chinese government spokesperson called the start of a “Golden Age” of UK-China relations. Yet, the success of its approach has yet to be proved, Brown adds. There is a desire to try to streamline and simplify the relationship and take it back to where it started—one track concentration on market access to each other, exploring mutually beneficial commercial and investment relations, and avoiding the treacherous terrain of security and political commitments. Even a focus, however, on purely economic links in recent years has proven difficult. Arguments over trade dumping in the late 2000s were replaced in 2012-2013 by fierce disagreements about solar panels and the overproduction of these flooding the European market. In 2015 and into 2016, this issue was superseded by anger within the European Union over steel, with China again accused of flooding the world market with goods produced in highly subsidized factories. The net result of this was a clear shift against attempting to grant China market economy status, allowing for yet further tariff reductions, signs of duplication in the economic realm the Chinese shock and disappointment experienced after the non-lifting of the arms embargo in the political and security realm over a decade before. Theresa Fallon observes that in the face of China slowly reweaving the international fabric of interrelations and governing structures, the European Union behaves as if geopolitics and power politics no longer exist. One test of Sino-EU relations is whether market economy status will be granted to China by December. Since all other WTO (World Trade Organization) members have already granted China this, if the European Union did too, the United States would be left alone facing legal action by China, leaving it disappointed with the European Union. She adds, Beijing has deep pockets and European companies are looking for profits at a time of austerity and deep budget cuts. Another test is “dual-use” technology sales by European companies to the People’s Republic of China (PRC), which have accelerated the People’s Liberation Army’s (PLA) development of military might and contributed to the changed strategic calculus and landscape in the South and East China seas. Competition to attract Chinese foreign direct investment allows for leakage of strategic technology. Neither the European Union nor its “Big-3” have an investment vetting mechanism akin to the Committee on Foreign Investment in the United States (CFIUS) to weigh economic opportunities against national security concerns she observes. Reflecting on the impact of “One Belt, One Road,” Fallon finds China aiming at creating political goodwill among its partners along the transport corridors. Relevant to this is the new forum launched by China for cooperation with Central and East European (CEE) countries: the ‘‘16 + 1.” Although vastly different culturally, linguistically, and in religion, these countries are united in their quest for Chinese investment. They are also all former communist states and thus share some common historical experience with China. China is careful to explain that the ‘‘16 + 1’’ does not supplant but rather supplements EU–China relations. However, the 11 countries that are also members of the European Union can easily form a pro-China lobby and, therefore, influence policy making in Brussels. Investments and increasing influence in the CEE may help to undermine the ties to a region long seen as supportive of US policies. China’s promise of multi-billion dollar investment deals, infrastructure development, railways, and increased win-win trade with China is eroding Europe’s ability to speak “with one voice” on PRC-related issues. Finally, Fallon questions whether the European Union will be able to craft a statement after the Arbitration Tribunal delivers its decision on the Philippines versus China. If not, she wonders about the impact on EU-US relations. The European Union has carefully danced around the complex issues involved in the South China Sea disputes. It has no interest in antagonizing China, needing it as an economic and security partner, given problems of its own, both internally (migration, terrorism, economic imbalances) and externally along its southern and eastern neighborhood. Yet, Fallon insists thatthe European Union, based on the rule of law, needs to uphold the principles of international law or lose credibility. It depends on its relationship with the United States and wishes to have good relations with Japan, a major trade and economic power, as well as with the fast-growing economies of Southeast Asia. The Joint Communication of the European Commission and of the High Representative of the Union for Foreign Affairs and Security Policy of June 22, 2016 on “Elements for a New EU Strategy on China” recognizes the importance for the European Union of freedom of navigation and overflight, given the large volume of international maritime trade passing through the South China Sea. Thus, if the European Union had to choose a camp after the announcement of the ruling of the Arbitration Tribunal, it would either not have any position at all, with each member state choosing its own camp or would align with the United States, she expects.